Gods Eater Burst is a tasty combat snack. With a name like Gods Eater Burst, I was sure that it was going to be Japanese. And I was sure that it was going to be weird. What I discovered was a pleasant, almost predictable videogame. Yes, it’s Japanese. And yes, there’s some weirdness. But being a Gods Eater isn’t as strange or unsettling as I thought it would be. Being a Gods Eater is a lot like being any other videogame hero. 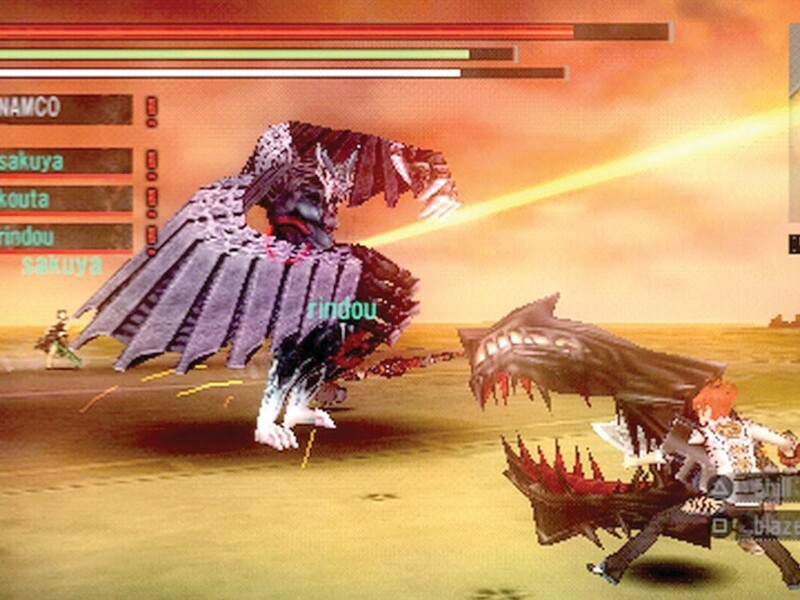 The short version of a Gods Eater’s job description is to hunt down and kill the game’s assortment of monsters. These monsters are the Aragami: evil spirits who have taken the forms of primitive gods. In other words, the monsters are a lot like giant predatory beasts. As revenge from the gods (or an alien invasion or whatever) Aragami have taken over most of the world, pushing humans to the brink of destruction. That’s where we come into the picture. Don’t get me wrong: a Gods Eater doesn’t actually eat the Aragami. The swords that are permanently attached to our arms eat the Aragami. Imagine the cartoon singing sword in Who Framed Roger Rabbit, but demonic and with fangs. The swords can also transform into guns. Somewhere in all of this is a feature that makes me a “New Type” Gods Eater, but I have no idea what the old type was like. I see a lot more action as a Gods Eater than I did when I was stalking monsters in my various Monster Hunter incarnations. Gods Eater Burst is about undertaking quick missions. I head out into a basic, blocky PSP world to kill a bunch of little gods or one big god. The gods and I hack, shoot and chew it out in real time with the added challenge of the PSP’s awkward aiming. Being a Gods Eater is never lonely. I’m perpetually sharing my battles with computer-controlled assistants. It’s a quick, handy substitute for Monster Hunter’s multiplayer battles, and my artifically informed friends are often as weird and unpredictable as I am. But give us a break, OK? We’re protecting humanity while lugging around big, chompy swordguns that are attached to our arms. And I haven’t even told you about the bursting. THE GOOD: Weapons are the way to grow in Gods Eater Burst, whether by strategically eating gods, or crafting programmable bullets. It brings a role-playing element to the real-time combat of the game, and gives its battles the variety that’s missing in the game’s limited assortment of gods. THE BAD: Only Japanese games have names like Gods Eater Burst. But only Japanese games are full of so many deadly dull anime cutscenes in which 3D models of the characters stand around onscreen gently swaying while epic electronic mu sic blasts in the background. It is easily the least engaging presentation imaginable for the game’s story, and it makes it difficult to care about many of the non-action portions of Gods Eater Burst. THE BOTTOM LINE: Gods Eater Burst is a tasty combat snack.